Emily Harrington did her 8th 5.14 in Full Eqip, a 5.14b in Oliana, Spain according to Climbing.com. Enzo Oddo and David Firneburg who are 16 and 15 respectively both repeated Chris Sharma’s Era Bella (5.14d) in Margalef, Spain. 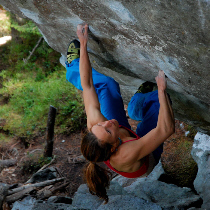 German Dorothea Karalus reports on her blog that she repeated Pura Vida (V12 or 13) in Magic Wood, Switzerland. On the heels of a 2nd place finish at the first bouldering World Cup of the season Austrian Jakob Schubert added his name to the growing list of people who have repeated Chris Sharma’s Papichulo (5.15a) in Oliana, Spain. More on the ascent at UKC. In Red River Gorge news, Nick Duttle repeated James Litz’s The Shocker (5.14b) despite the fact that it apparently is never going to stop raining in Kentucky leading to at least one of the holds on the route being wet. Chris Sharma does not eat Paleo/Zone/WTF. In fact, I can’t think of one truly elite athlete that follows any incredibly strict diet. I would bet they are conscious of what they eat because they know their bodies, but not religious about it. Yet there are legions of people out there trying to improve their amateur sports performance through bizzare diets. I would call them idiots, but it’s really a form of gullibility brought on by wishful thinking. It was sad to read this morning about the passing of Swiss alpinist Erhard Loretan, someone I recall reading about many times over the years.